According to ESPN NFL Insider Adam Schefter, the team and Bradham have agreed to a long-term deal, likely keeping him in Philadelphia for the foreseeable future. - The Eagles remained active throughout the day Tuesday restructuring contracts, signing veterans, and saying goodbye to fan favorites. 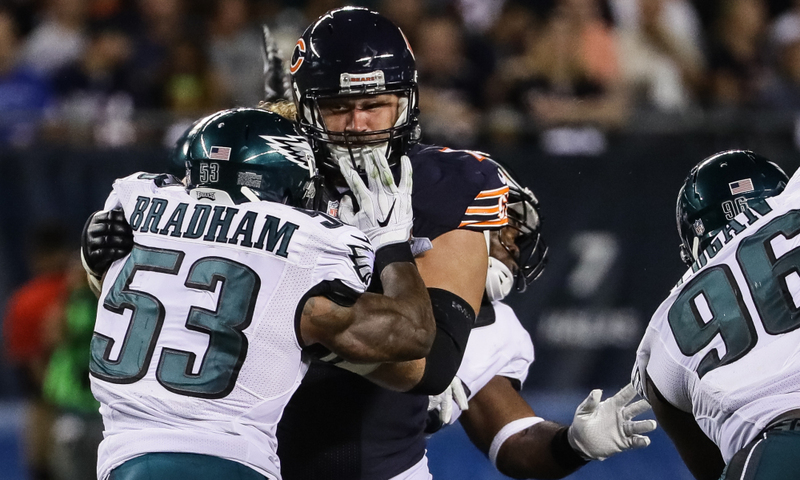 Over the last two seasons, Bradham led the Eagles in tackles (184), sacks (three), forced fumbles (three), passes defensed (13), and defensive snaps played (1,913) among all linebackers. He had a sack to go along with 11 tackles in the postseason. For a unit that already features Mychal Kendricks at weakside linebacker (or Corey Nelson if Kendricks is traded) and Jordan Hicks at middle linebacker, retaining Bradham makes this unit as deadly as ever for the Eagles. The 28-year-old, who played his college football at Florida State University, was originally selected by the Buffalo Bills in the fourth round (105th pick overall) of the 2012 NFL Draft. He also forced a fumble on a lateral play that was picked up by defensive end Brandon Graham and returned for a victory-sealing touchdown in the division-clinching win at L.A. Rams in Week 14. Kendricks totaled 63 tackles between the regular season and the playoffs.